On Saturday and Sunday, two weeks ago, we saw the Grand Canyon!!!!!!!!!!!!!!!!! Our first view of the Grand Canyon! That sentence deserved its own paragraph! Wow, wow, wow is what it looked like!! The absolute most amazing sight ever and a lifetime dream fulfilled! Everyone has raved so much about it that I almost thought I might be disappointed but I was absolutely NOT disappointed. Dora and Boots at the Grand Canyon!! A little laying out of the land first. 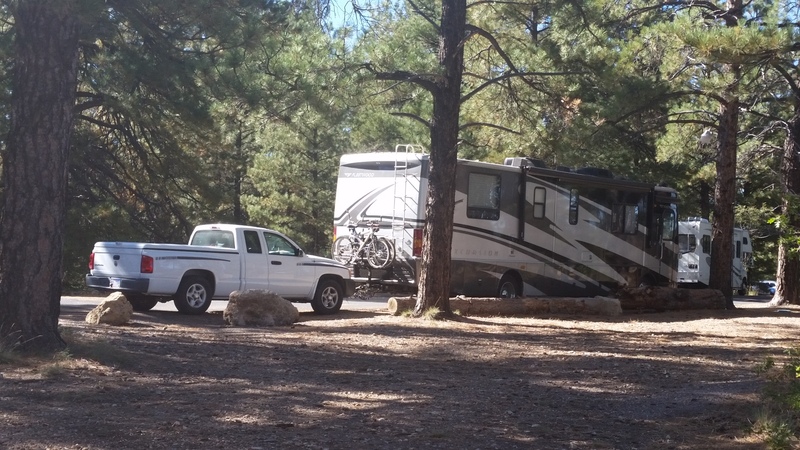 The entry to the Grand Canyon National Park is a good distance from the actual North Rim and there is a lot to see along the way including giant pines, Douglas firs and beautiful aspens with their golden leaves shimmering. Some of the pictures near the end in my next blog post are from that beautiful sight! The last video is from that area. The night before there was a freeze warning in effect and the North Rim closes mid October so our timing was great. I was dressed far from prepared for coldness but it felt wonderful after several 100 plus degree days. 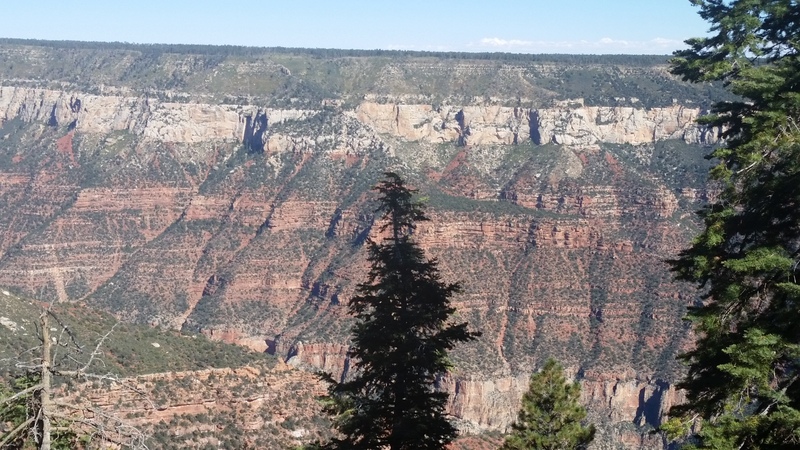 Our GPS took us directly to the North Rim which has its viewing area in one very large place. The first photo in the photos post was our first view of the Grand Canyon. I could go on and on and would never be able to explain how special this place is so I’ll let the photos and videos speak for themselves. If you make only one trip during your life, I believe this one should be it! See both rims if you can! 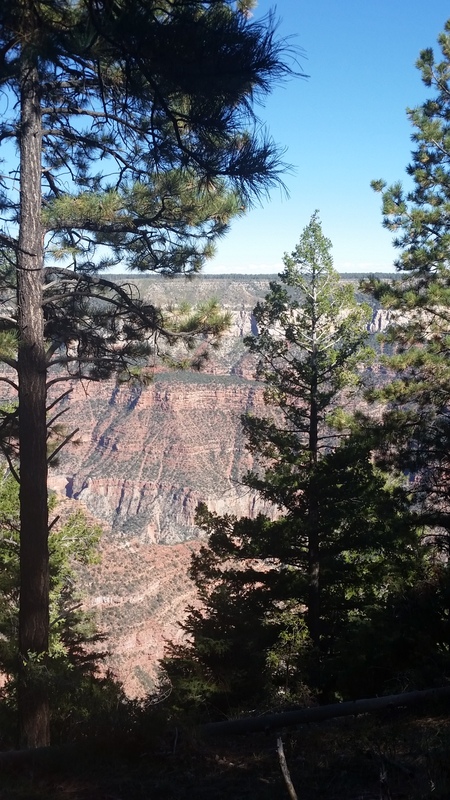 I’m going to share today several videos from the North Rim. Photos will come soon. There are ONLY 8 videos and I have over 300 North Rim photos to go through!!! The North and South Rim are only about 20 miles apart but the drive goes way around the side of the mountains and through some mountains to get to the other side about 200 miles away. We drove about halfway and parked for the night in the Marble Canyon – A M A Z I N G!!! I have always wanted to sleep way out in the desert and this really qualifies! There is a sign that says you can walk out in the desert but to be careful of the baby cacti growing! I thought that was so cute! This is a video of Marble Canyon where Dora and the Explorers spent the night! Travel update as of 10/17/15. We are leaving Casa Grande, Arizona some time today headed for an overnight stop in Willcox, AZ (where we have a homemade apple pie waiting and free waffles and coffee for breakfast!!) and then on to White Sands National Monument in New Mexico. Our oldest son took me there several years ago and it is such an amazing place I knew Roy and I needed to stop there as we travel home to Louisiana.